Transport: buses (57A/C) serves start/end. of which, although mostly pathless, is nice and runnable, and offers uninterrupted views (cloud permitting) of the Applecross/Torridon hills on one side, and the Outer Hebrides on the other. 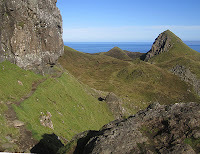 But there's plenty more interest close by - this route starts by exploring the famous "Quirrang" and finishes with "the Storr" before dropping down to an easy road-run for the final downhill miles to Portree. I guess its possible to cut out the road and and fit this into a (very) long day walk. I was based in Portree, and used the bus to get to the start (Flodigarry) and wanted to run back to "base". It was a late start for me. I'd been on holiday for 10 days now and had long forgotten what 7am felt or looked like (leaving that to next week when back at work!). At about 1pm the bus driver dropped me off just beyond the "Flodigarry" sign, where another sign indicates a public footpath to the Quirrang. After day after day of rain, wind and cold, today was a stunner. I'd almost given up and vowed to save my holidays for the Canaries at this time of year! But today Skye was warm, barely a cloud and barely a breeze. The path climbs up past a couple of nice lochans, steep at times but not for long, then into the rocky wierdness that is the Quirrang. Other paths branch off to explore, I just kept on the main one which heads for the base of the escarpment and follows it around, heavenly trail-running here, eventually arriving at the ever-busy car-park at the top of the pass where a minor road crosses the peninsula. It gets much more peaceful from here on, with the Trotternish escarpment stretched out ahead, mile after mile. Traces of a path eventually peter-out on the way South to Bioda Buidhe, but the relatively gentle gradient and grassy terrain mean it remains very runnable. After this initial top, I made the mistake of continuing down the tempting slopes South and had to backtrack uphill slightly on awkward clumpy slopes to negotiate a big gash in the hillside! It seemed like a long way onwards to 611m Beinn Edra, and instead of sticking to the crest I tried to cut the corner after Bealach Uige, which was swampy and slow going. For most of this section there was a good view down into Uig. As I progressed South I noticed the ups and downs were getting steeper. Since Edra the ridge had narrowed as it took in a succession of summits. I was getting rather thirsty - as you'd expect there'd been no flowing water along the crest. Thankfully I found somewhere to fill the bottle in the Bealach Chaiplin on the slopes of Flashvein. Knowing I'd be running out of daylight I cut out the promontory of "Sgurr a Mhadaidh Ruaidh" and headed straight for the next summit. There were more opportunites to fill the bottle after here. I descended the brilliant Bealach Hartaval and struggled up Hartaval. "The Storr" now lay ahead - the highest (and for me ultimate) summit of the day. Descending Hartaval to the bealach took a bit of care cutting down through broken crags (the further W, the less crags), and as I descended, the onward slope of the Storr looked imposing. It wasn't as precipitous as it looked, but I finally succumbed to a walk here. Having studied the map before setting out, I knew I'd be walking this bit! The view from the summit was the best of the day, as the as the Cuillin were now much closer and the view of them was now uninterrupted. From here it was an easy downhill run to the Bealachs "Beag & Mor". At the latter, I picked up the start of a track descending East into the shadow of the escarpment. This track petered-out and I was soon making my own awkward way down to the nearest burn, finding it easier to run on marshy grass than leggy heather. Eventually came out onto the road "A855", and the tarmac felt incredibly easy after this long mostly pathless day! I felt strong again so really picked up the pace, wanting to get off the main road and down to Portree before darkness.